Mexico’s Pacific Treasure is gaining traction with a younger market segment thanks to shows like Ruta Joven and Tour al Descubierto. 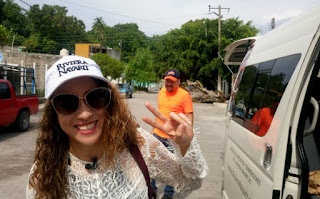 The production team for Mexico Travel Channel’s Ruta Joven and Tour al Descubierto were in town to tape both these shows as part of the activities organized by the Riviera Nayarit’s Public Relations department. The shows were transmitted on Monday, August 28 and Wednesday, August 30, respectively. These productions are the result of actions set into motion by the Public Relations department of the Riviera Nayarit Convention and Visitors Bureau (CVB), in order to continue positioning the destination by focusing on its natural beauty and unique culture. 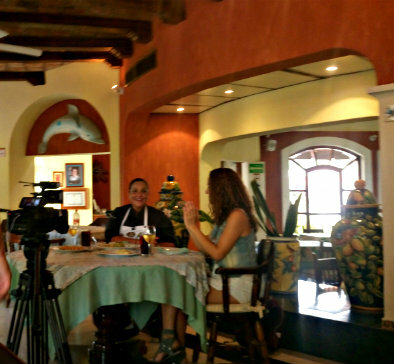 Mexico Travel Channel is transmitted via the main cable stations throughout Mexico, Latin America and Europe, and has an audience of more than 12 million viewers; it’s also viewed on an open signal in the United States. “The Convention and Visitors Bureau (CVB) lends its support to the Mexico Travel Channel’s programs such as Ruta Joven and Tour al Descubierto as they not only contribute to the promotion of the destination, but in this case, they also work to attract tourists from the younger segments,” said Marc Murphy, Managing Director for this tourism promotion office. Ruta Joven is directed towards men and women between the ages of 28 and 35 years, and it presents ways to get to know a tourism destination on a budget. Host Jennifer Ajás guides the viewer in a fun casual way through the most iconic places of the destinations she visits, giving recommendations on how to enjoy a special weekend. Length: 30 minutes (24 real time). Air date: Monday, August 28th at 20:00 hrs. This is a dynamic new concept that takes viewers to any destination in the Mexican Republic guided by Jesús Enrique Díaz Morán and Edgar Guillermo López Martínez. It has a reality show-type format and is directed towards an audience of men and women between the ages of 28 and 45. Length: 30 minutes (24 real time). Air date: Wednesday, August 30 at 20:00 hrs. Guillermo Guerrero, PR Coordinator for the CVB, welcomed the hosts and the production team at the Amado Nervo airport in Tepic on Wednesday, August 23rd. From there they traveled to San Blas, where they were charmed by the history of the port after their visit to the San Basilio mountain, the Contaduría, and the temple built in honor of the Virgin of the Rosary, patron saint of sailors. They also enjoyed chef Betty Vázquez’ cuisine and hospitality at the Garza Canela hotel, and marveled at the sunrise from the Las Garzas overlook. On Thursday the 24th they were scheduled to travel to Banderas Bay, but they couldn’t leave San Blas without seeing La Tovara and the crocodilarium, so they made the most of the morning by touring this one-of-a-kind mangrove ecosystem. Once they arrived in Banderas Bay, their first stop was in Bucerías. They left there on Friday the 25th to tour other communities including the Magical Town of Sayulita and Lo de Marcos, a traditional fishing village. On Saturday August 26th, the team returned to Mexico City truly enthralled by the diversity of the coastal scenery and the quality of the Riviera Nayarit properties, its culture and the variety of activities and sports equipment that can be enjoyed here, which will, no doubt, be of great interest to their viewing audience.